Upon investigation of this accident it was found that B-17F, 42-29586, took off at 1920 PWT on March 4, 1943, on a routine instrument training flight on the Blythe range. The aircraft received clearance from Blythe radio at 1923 PWT to begin practice. At 2110 PWT the aircraft contacted the 34th Bombardment Group and gave position over Blythe. At approximately 0300 MWT, March 5, 1943, Winslow Radio notified Blythe Radio that the aircraft was calling Blythe radio. 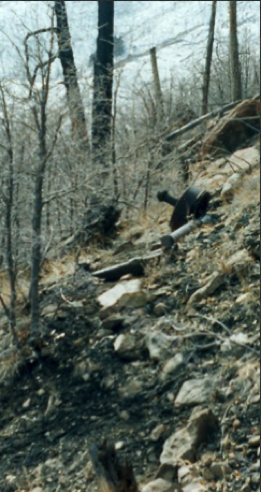 At 0145 MWT the aircraft crashed into the East side of Mount Elden, Flagstaff, Arizona, at altitude of 8000' MSL with fatal results to all on board. The weather at 0145 MWT in the vicinity of Mount Elden was overcast. The wreck site today is easily accessible. Remains at the crash site include the main landing gears and small scattered debris. A few things about this crash site. I always thought the photos from the mishap report were particularly haunting. The tail section has a tragic skeleton quality to it, but yet retains the serial number. In addition, the forest has seen considerable changes. 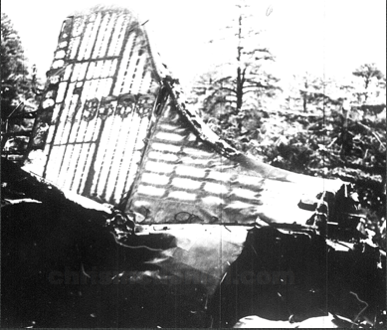 In 1943, the plane crashed into a dense forest. The forest is no longer dense. Keith (mishap report says Keitt) O Martin Jr. 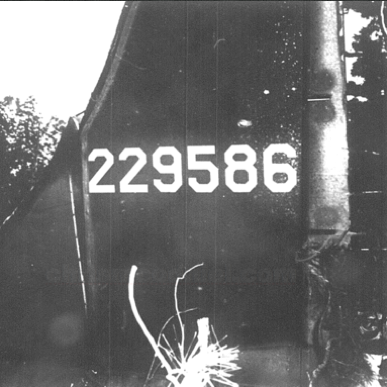 Burned tail section of 42-29586 on Mt. Elden. Another view of the tail section. View of one of the main landing gears. View of the second landing gears. It's been several decades since I took this picture. 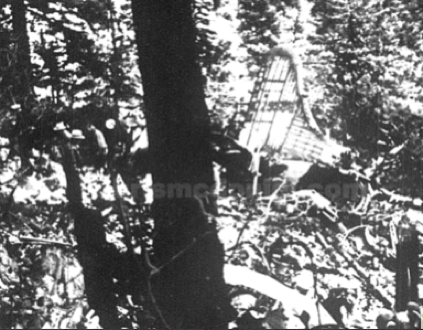 When the plane crashes, the forest was very dense.